Schedule some time to play. To experiment. To explore. Often it will lead nowhere. 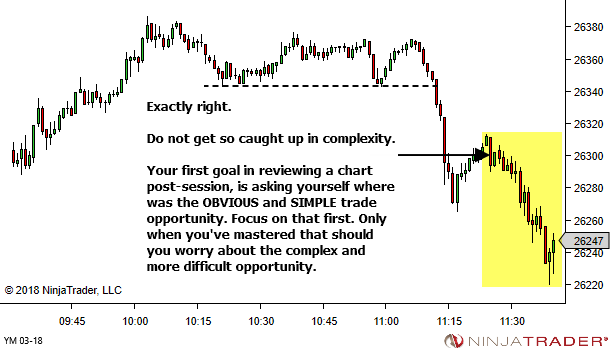 But sometimes it might create new insights which transform your trading and your life. Persistent thought 1: "Is there any reason why I have to wait till 0930ET (12:30am my time)? 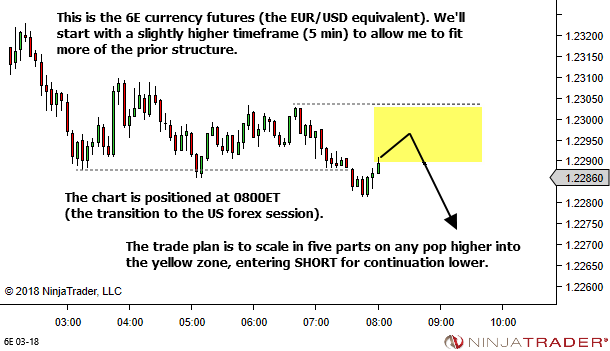 When "life" allows, why don't I trade the currencies from 0800 to 0930 and then shift across to my normal market?" Persistent thought 2: "I really need to explore the idea of scaling in – spreading an entry across a zone rather than going all-in." If you're like me you'll find thoughts and ideas repeatedly competing for your attention. Don't discard them. Their might be gold in those ideas. 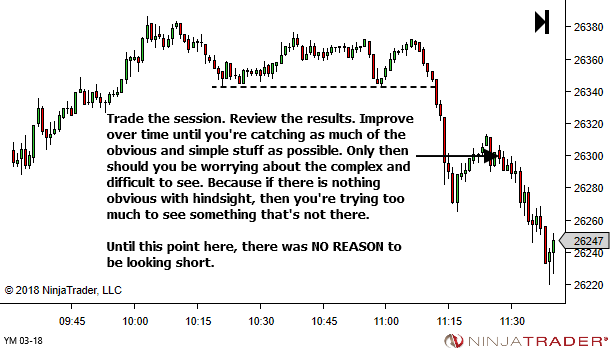 But don't let them distract you from your main job of trading your current defined strategy. Schedule some time outside of normal work hours for play and experimentation. I enjoyed this. It's been quite a long time since my last play with currencies. 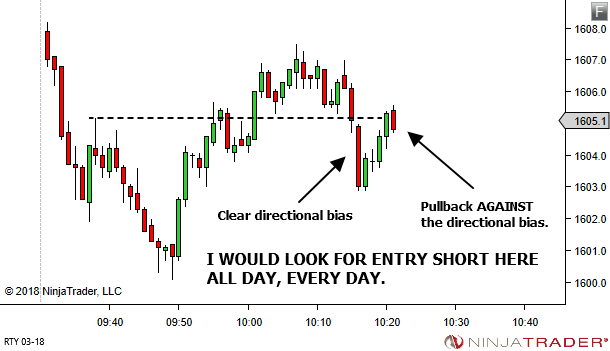 And while life doesn't usually allow me to be ready for trading by 11pm, I see absolutely no reason why I shouldn't consider trading the currencies on those odd occasions when it does. It certainly beats sitting and waiting for another hour and a half. I've tried this several times in the past, but always abandoned it. It's clear my strength is precision entries, all-in, with imperfection managed through scratching and re-entering as required. And yet the idea keeps persisting. I will likely play with this more, as time allows. But I have to make sure that when I feel the trade tipping in my favour, I've got to get full size on. 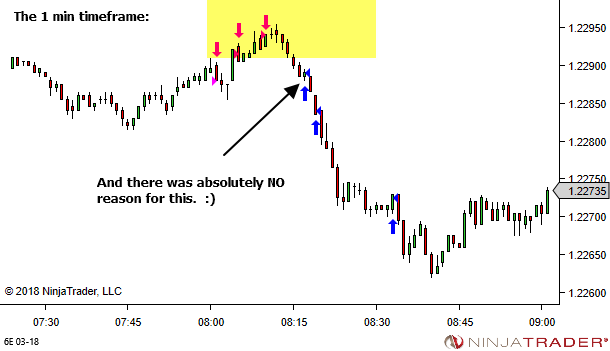 In any case… today's goal of simply experimenting in the hour and a half prior to the US emini open… was a resounding success. Let's go over this key concept one more time. 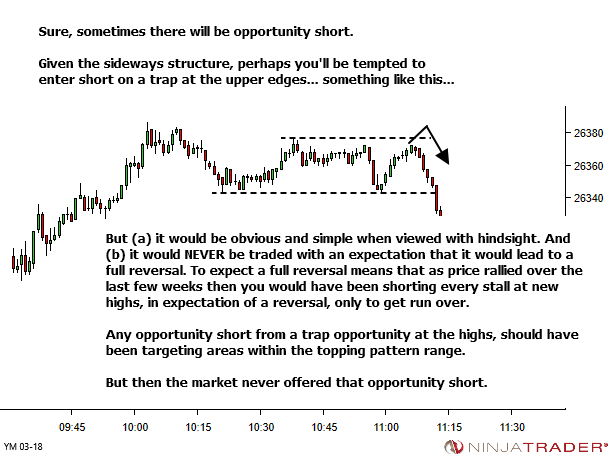 Keep in mind a visualisation (or a series of visualisations) which broadly capture the vast majority of your trades. 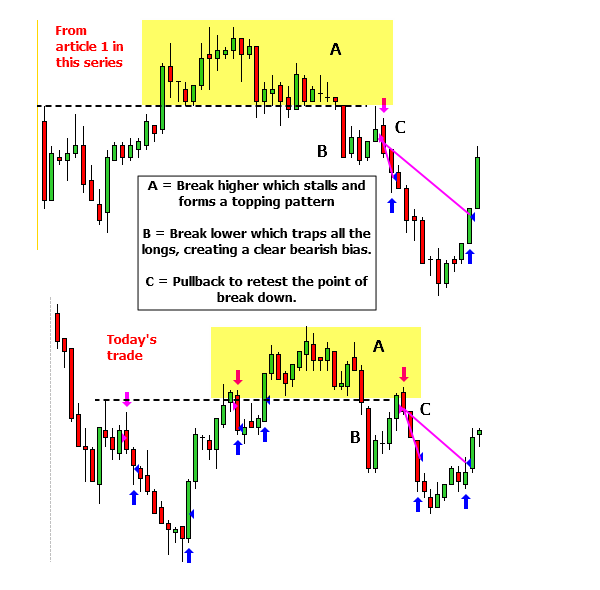 It can help provide confirmation of the trade idea as it's setting up. And more importantly, confidence in execution. We discussed this recently via two articles – part one and part two. 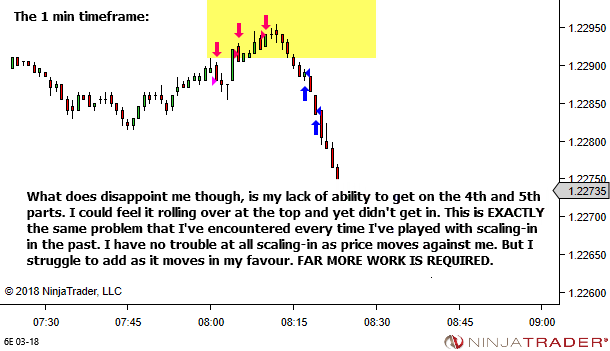 Both articles discussed the fact that the majority of my trades lately seem to fit within one of two broad categories. 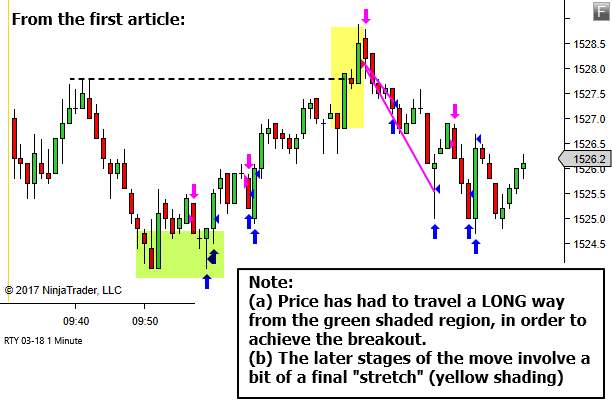 The first article in this series shared a type-1 trade. 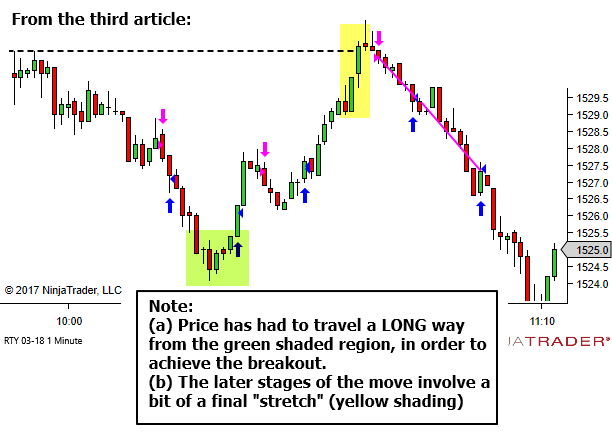 The second article in this series compared three type-2 trades. Today I thought we could look at one more type-1 trade. Ok, so the trade didn't reach it's ultimate target in this case. 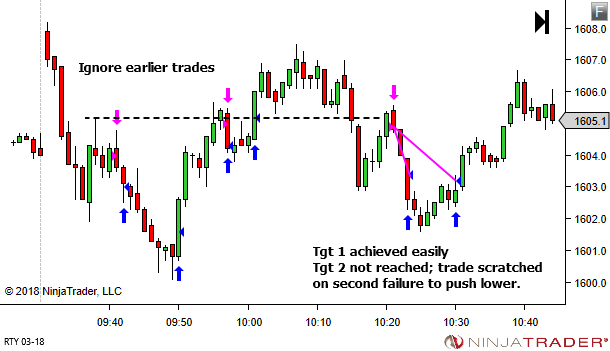 But "active trade management" recognised the failure to push lower and scratched the position, locking in some good profits anyway. 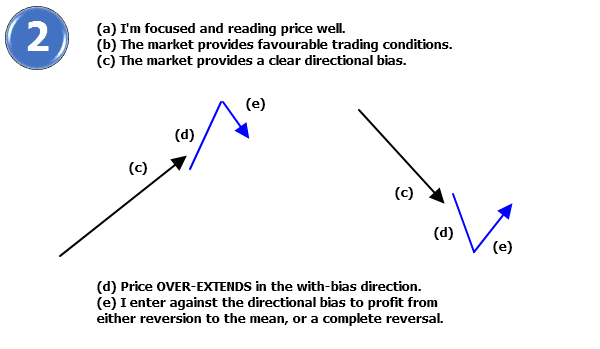 (1) Note how "a clear directional bias" does not necessarily mean a strong and persistent downtrend. 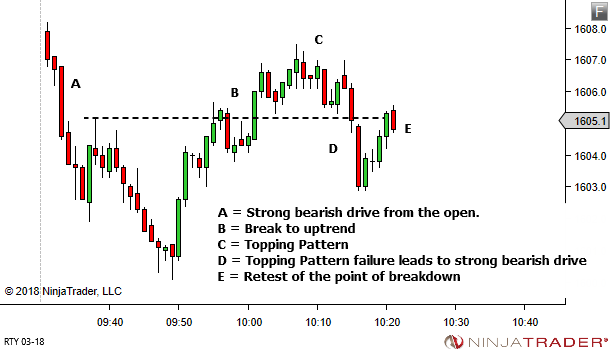 In this case we have a somewhat sideways market, shifting from initial downtrend to uptrend and then back again to downtrend. 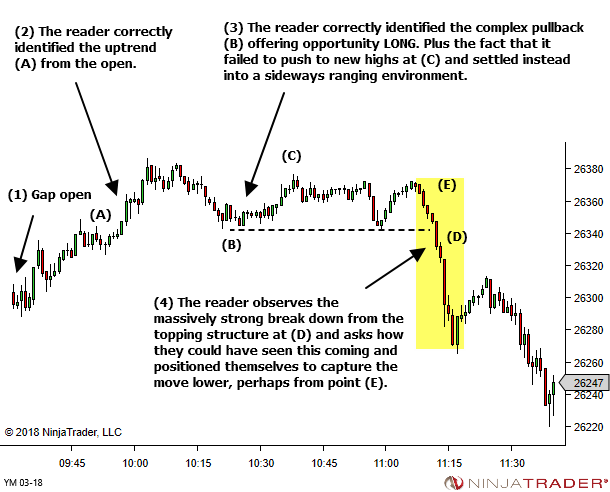 The "clear directional bias" occurred at the point of failure of the uptrend, when anyone holding a long position would have found themselves trapped. When they knew without doubt that they were sitting on a loser and had no choice but to get out. 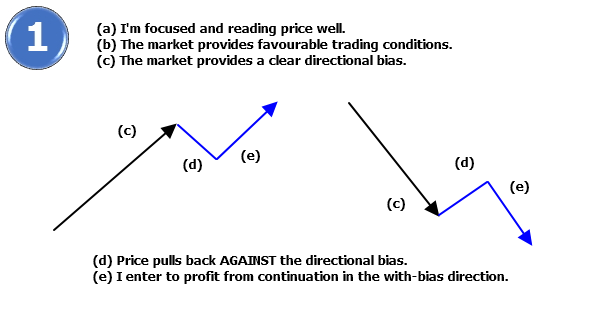 It's the trap in this case which creates the "clear directional bias". 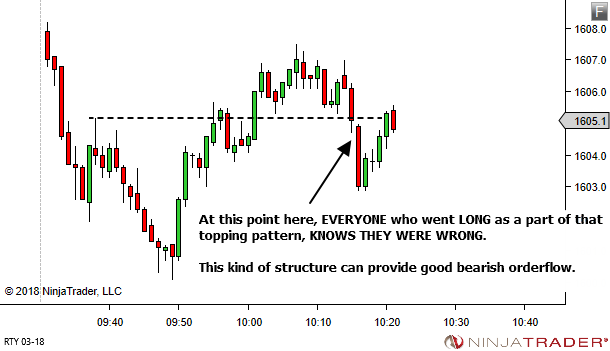 And it's the pullback against that bias, towards the point of break of the topping pattern, which offers my trade opportunity. 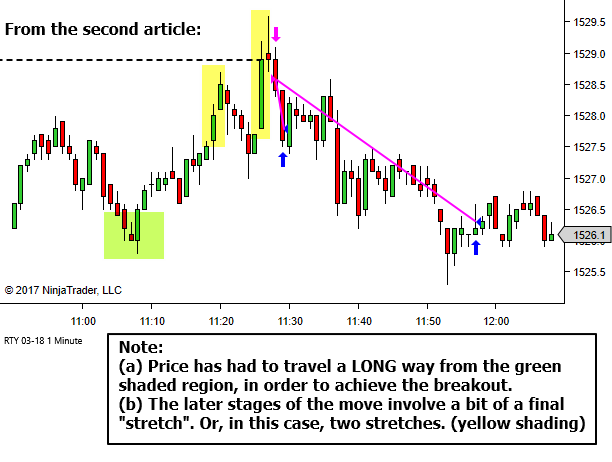 (2) And most importantly, I want you to take note of the similarity with the trade from the first article in this series. They all look much the same. 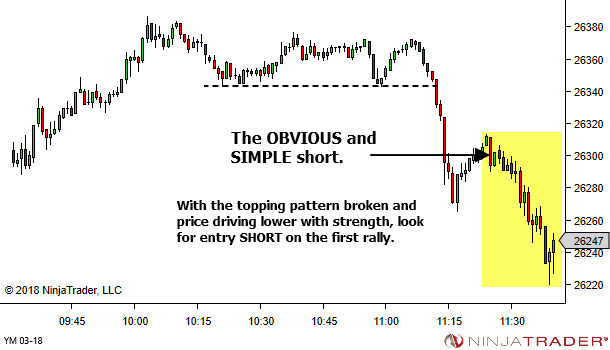 It helps with identifying the setup. And it helps with confidence in execution. Because I've seen it all before. 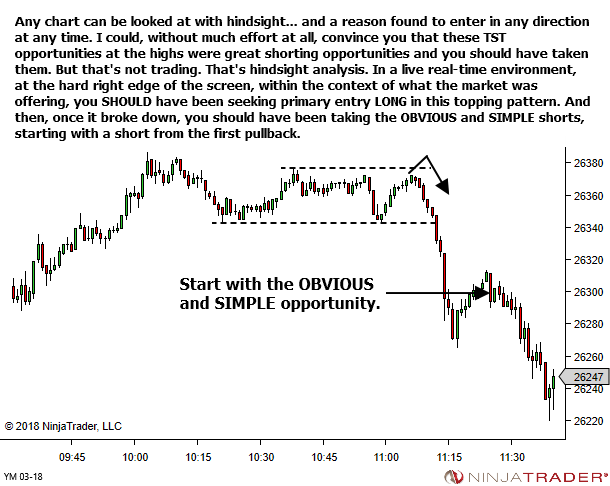 Just over a month ago we discussed the fact that the majority of my trades lately seem to fit within one of two broad categories. In the week's since then we have focused on something different. 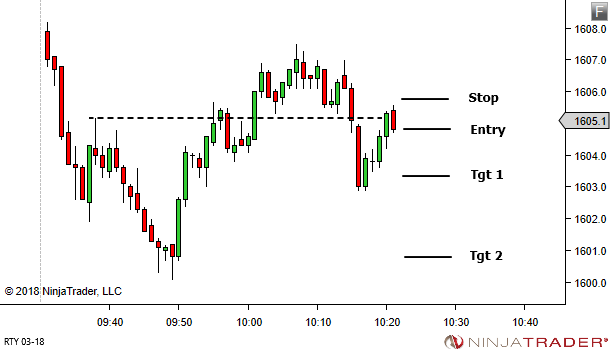 A series of three articles showing breakout failure trades – here, here and here. 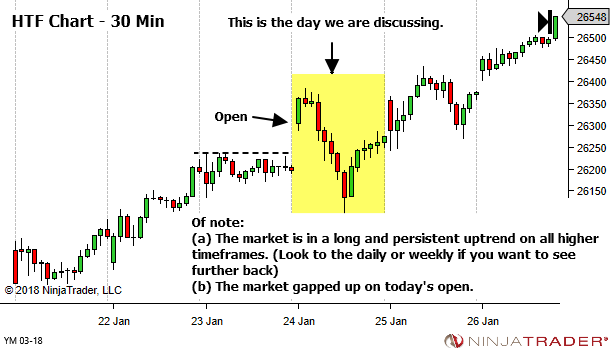 The focus of these articles was on using the lower timeframe chart to confirm a lack of buying interest after the break. 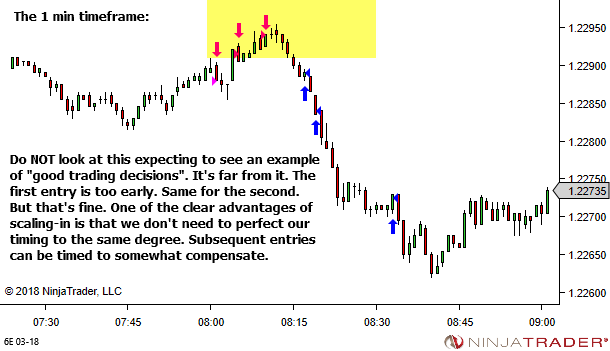 And for timing the entry at the point where we feel any later buyers have completely given up all hope of their trade working. 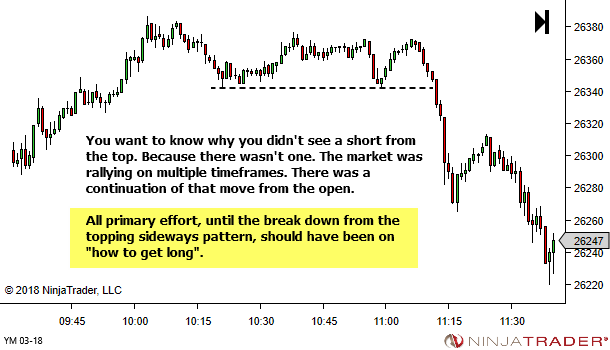 But there is another VERY important point from these three breakout failure trades, that I think we need to discuss. You may have noticed it. I HOPE you noticed it. They all fit (perhaps loosely) into the broad description for the second type of trade. Let's examine all three from this perspective.